It is a fact of professional life that someone must choose you to be successful. Usually, this someone is your immediate boss, and it pays to do everything in your power to make yourself valuable to this important individual. Before diving into a number of ideas on making yourself even more valuable to your boss, let’s explore the issue of someone needing to choose you to be successful. More than a few people have suggested that this thinking discounts the importance of individual determination and hard work. A polite pushback is that nothing replaces or minimizes the need for these behaviors—they are essential for success. 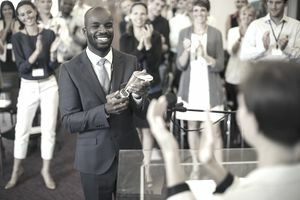 However, for your efforts to pay off in an organizational setting, your hard work must be recognized and appreciated by some person or some group able to choose you to do more. Yes, power and politics play a role in your success, no matter how hard you work. Senior managers select individuals for promotion or advancement based on how much they trust him/her to make good decisions to lead initiatives or manage teams. This trust is cultivated through experience working together and ample evidence that the individual under consideration for advancement displays consistently good judgment when it comes working with others, solving problems, setting priorities and creating results that help the organization. Since many advancement opportunities are stretch assignments for us—larger in scale and broader in scope than our prior experiences—this factor of trust is critical. The individual extending the new opportunity to us is trusting that we will grow safely and quickly into the role. Given the importance of trust and the power your boss has to select you for “more,” it is essential for you to help make his/her decision an easy one when it comes to considering you for new opportunities. Nothing says “I care and I am committed” more than striving to understand and support your boss’s priorities and goals. Not every boss is forthcoming with their own professional goals and personal aspirations, so you may have to dig just a bit. Use the rationale that you want to ensure your goals align with her goals. Ask clarifying questions. The magnetic attraction of gossip is potentially toxic to your career. Steer clear of most of these group gatherings and their negative banter. Nonetheless, it pays to keep your ears and eyes open looking for the nuggets of truth often present in workplace gossip. If you learn that people are confused over the firm’s direction or latest strategy, this is important information for your boss. Filter out the "he said/she said" gossip, but don’t discount the talk that highlights organizational shortcomings and opportunities. No one loves a negative surprise, least of all, your boss. If you see or sense something going wrong, run, don’t walk to share this information. Your advance warning will enable her to help mitigate the problem or at least plan how she will share it with her boss and others in the organization. The most destructive words to your credibility with the boss are, “What do you think I should do?” Purge that phrase from your lexicon and remember to always enter the boss’s office with a plan—preferably two options with one preferred. Be prepared to support your recommendation. Whether you recognize it or not, you are an ambassador for your boss, reflecting on his or her reputation and ability to select and develop good people. Act accordingly. Armed with context for your boss’s priorities, attempt to build allies and represent those interests in the spirit of strengthening the organization. Also, work hard to understand the priorities of other leaders and groups and ensure that your boss has this intelligence to apply to her own efforts. Smart professionals master the fine art of showcasing their successful results without crossing the line to obnoxiousness. Modesty is not your ally when it comes to building credibility for advancement. Make certain to share the spotlight with those who helped bring about your good results. Nothing reflects better on a boss’s selection of you for a promotion than your proven ability to also develop great talent. Ignoring the realities of power and politics in your organization is naïve. Recognize the power your boss has in choosing you to be successful and act accordingly.